(0 Customer Reviews) | Write Review 4 issues per year Embrace a wilder life – download Wildlife Australia, the country’s leading nature magazine. Fifty pages of insightful and thought-provoking articles and stunning photographs. Insights: The articles are written by leading researchers and those whose care for nature comes from deep insights. You won’t find this information by Googling. Beauty: Immerse yourself in the allure and charm of wildlife with photos by some of Australia’s leading nature photographers. Understanding: Wildlife Australia is a hub for people who value their relationship with nature and know it is enriched by knowledge. The nature experience can be powerful, but often requires interpretation. Inspiration: Be inspired by what people are doing to understand and protect nature. Conservation: Wildlife Australia is a not-for-profit magazine and all profits go to protect nature. A subscription to Wildlife Australia won't cure arthritis or tonsillitis, but is great for two modern ailments: dislocation from nature and existential malaise. Download the app and see. •	What happens to wildlife when darkness is banished? Darryl Jones sheds light. Embrace a wilder life – download Wildlife Australia, the country’s leading nature magazine. Fifty pages of insightful and thought-provoking articles and stunning photographs. 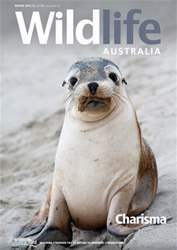 You'll receive 4 issues during a 1 year Wildlife Australia magazine subscription. You'll receive 4 issues during a 1 year Wildlife Australia magazine print subscription.